While Tillerson did not directly demand that India should snap all ties with North Korea, sources claim that Indian officials are aware that Washington would like New Delhi to take the step based on indirect feelers. New Delhi: India has declined to close down its embassy in North Korea, a decision that it conveyed to US secretary of state Rex Tillerson on Friday. While the Trump administration did not formally request this of the Indian government, it has been urging various countries to isolate North Korea – and New Delhi had been indirectly apprised that Washington would prefer India to snap ties. Tillerson arrived in New Delhi on Tuesday night after a whirlwind tour through Saudi Arabia, Qatar, Afghanistan, Iraq and Pakistan. Besides external affairs minister Sushma Swaraj, he met with National Security Advisor Ajit Doval and called on Prime Minister Narendra Modi. India has been ramping up its rhetoric on North Korea this year to align itself closely with the key foreign policy priority of the Trump administration. This change in rhetoric was most visible in the India-US joint statement issued during PM Modi’s visit to Washington in June to meet President Donald Trump for the first time. India has been North Korea’s second biggest trade partner, after China. As per the Directorate General of Foreign Trade, India’s export to North Korea was $76.52 million and import stood at $132.53 million in 2014-15. While India largely exported oilmeals, cotton yarn and machinery, Pyongyang exported iron and steel. From $209.05 million, the bilateral came down $130.38 million in 2016-17. North Korea’s imports in the first two months of this financial year was $4.74 million, while export was $6.21 million. In April, India banned all trade with Democratic People’s Republic of Korea (DPRK), except for food and medicine – in line with United Nations Security Council sanctions. The US had earlier threatened to end trade ties with countries which continue to support the North Korean regime. While it has sought to publicly give assurance of minimising trade relations, New Delhi made it clear that it will not snap diplomatic ties. “We had an open discussion on this subject,” said Swaraj. She noted that India’s trade with North Korea can be described as “minimal”. On the embassy closure, she pointed out that India’s diplomatic mission had a very small presence. India’s embassy in Pyongyang has around two diplomats. “I told secretary Tillerson that embassies of some of your friendly countries should remain there so that some channels of communication remain open. Many times, you may have need to talk…a mutual dialogue may be required to resolve some issues. At least one embassy should be there from your friends. And I believe that he understood this,” she said at a press conference after discussions in Delhi on Wednesday. Swaraj argued that India’s diplomatic presence would be helpful to the US, in case Washington wanted to convey a message to the North Korean regime. Calling him a ‘rocket man’ at the UN, President Trump has kept up a war of words against the North Korean dictator Kim Jong-Un. With Trump threatening to destroy North Korea, Kim called him “mentally deranged”. This year, North Korea has conducted 15 missile tests since February. This included a ICBM missile test on July 4. On September 3, North Korea conducted its sixth nuclear test, but the first of a Hydrogen bomb. India had expressed “deep concern” about the test. 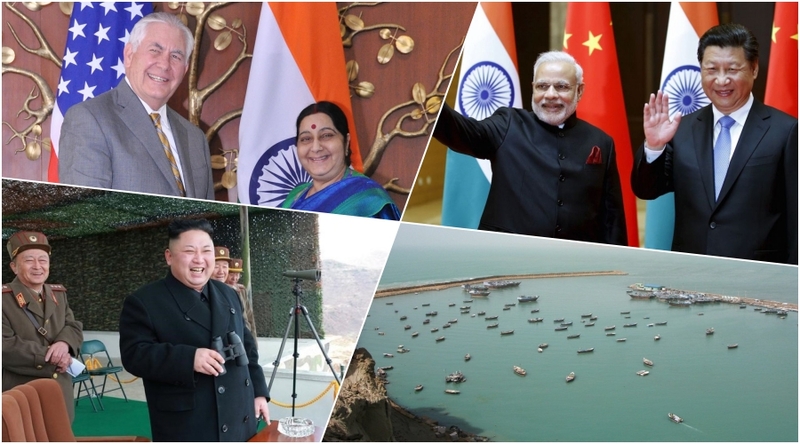 In the June joint statement, India and US had “pledged to work together to counter the DPRK’s weapons of mass destruction programmes, including by holding accountable all parties that support these programs.” However, in September, India endorsed the BRICS Xiamen declaration which called for a “direct dialogue” involved in the Korean Peninsula crisis. 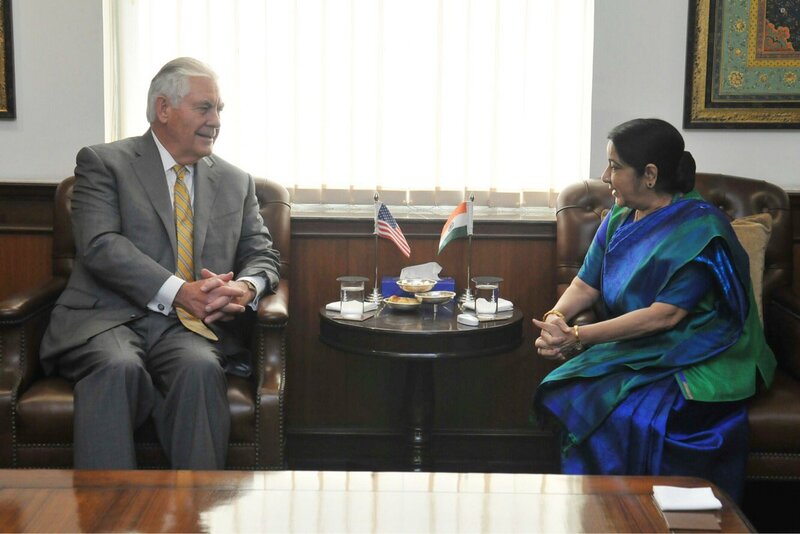 Sources said that while Tillerson did not directly demand that India should snap all ties with North Korea, Indian officials were aware that Washington would like New Delhi to take the step based on indirect feelers. Therefore, Swaraj was also ready to speak about India’s stance during the 40-minute meeting between the two sides. 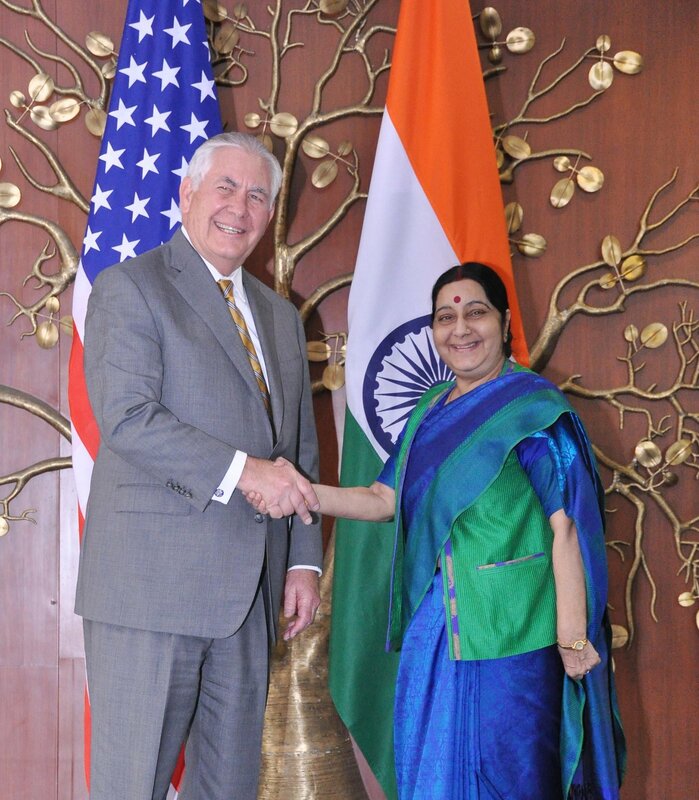 Overall, Swaraj and Tillerson spent over 90 minutes together, which included a working lunch. The major part of the discussions held at Jawaharlal Nehru Bhawan in Delhi was related to the US’s Afghanistan-Pakistan policy, which has been warmly welcomed by India. “There are too many terror organisations which find a safe place in Pakistan … safe havens won’t be tolerated,” said Tillerson at the press conference. 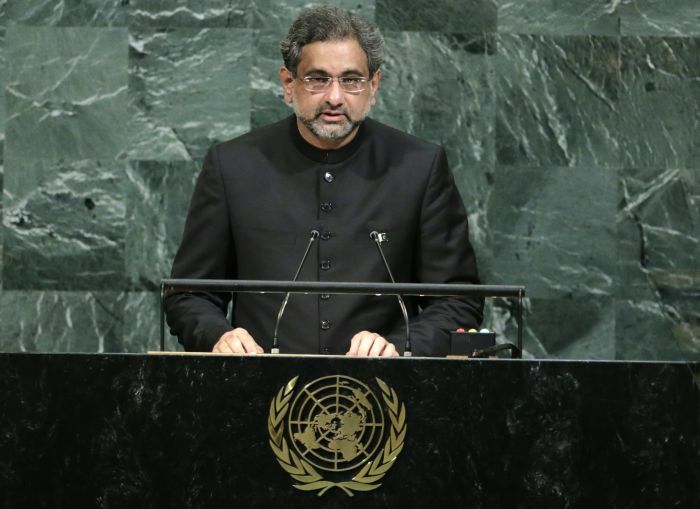 He indicated that Pakistan has been given a ‘to-do’ list on curbing the activities of terror groups. Also Read: The US Has Shown Its Teeth With Trump’s Afghanistan Policy, but Can It Bite? “We are attempting to put in place a cooperation mechanism [with Pakistan], not just on info sharing but also action – to deny them ability to launch attacks against other countries,” stated Tillerson. He said that taking action against terror groups was in Pakistan’s long-term interests too. “We are also concerned about stability and security of Pakistan government as well, as they have enlarged their capacity within the country and threaten to destabilise,” Tillerson said, adding that US wants to work with Islamabad in a “positive way”. Swaraj claimed both of them agreed that Pakistan should “take immediate to dismantle safe havens which have been established there for terrorist groups”. “We believe that effective action by Pakistan against all terrorist groups without distinction is critical to the success of the new strategy of President Trump,” she said. Expressing grave concern at recent uptick in violence in Afghanistan, the Indian minister said that these attacks “demonstrate that safe havens and support systems continue to be available to the terrorists”. On the issue of Iran, Tillerson reiterated that the US wants its allies to also support sanctions on the Iranian government. However, to a pointed question on India’s Chabahar project, he indicated that Washington will not be a roadblock. “It is not our objective to harm the Iranian people. Nor is it our objective to interfere with legitimate business activities which are going on with other businesses, whether they be from Europe, India or agreements that are in place that promote economic development to the benefit of our friends and allies as well,” he said. The development of Chabahar port is India’s key connectivity to link to land-locked Afghanistan and Central Asia, bypassing Pakistan. According to sources, the Rohingya refugee crisis was also raised during the talks. The US has indicated that it was considering to impose targeted sanctions against the Myanmar government. India urged US that the international community should find a consensus on dealing with Myanmar and indicated that a strong-arm approach may not be the best way. Tillerson reiterated that US wants India’s support in maintaining the rules-based international order, which was a pointed reference to Chinese moves in the disputed South China Sea. Swaraj also noted that both sides have similar position about principles underlying connectivity projects – a reference to India and US’s critique of China’s Belt and Road Initiative. Swaraj also raised the issue of proposal for curtailment of H1-B and L-1 visa programme, stating that Indian skilled professionals have made “significant contribution to the US economy”. “I have also sought secretary Tillerson’s support for resolution of long-pending issue of totalisation and asked that nothing such should be done by US which adversely affects India’s interests,” she added. A host of other US-India meetings are expected to take place soon. Next month, Trump’s daughter and presidential advisor Ivanka Trump will take part in the Global Entrepreneurship Summit in Hyderabad. In December, the inaugural meeting of the bilateral mechanism on domestic and international terrorist designations in India will take place. The first two plus two meeting between foreign and defence ministers will be held early next year.